Latest Government jobs for 125 various posts under NIT Calicut 2018. Those who are looking to grab a Government job in India can apply through the offline application form for DIRECT INTERVIEW round for the selection. 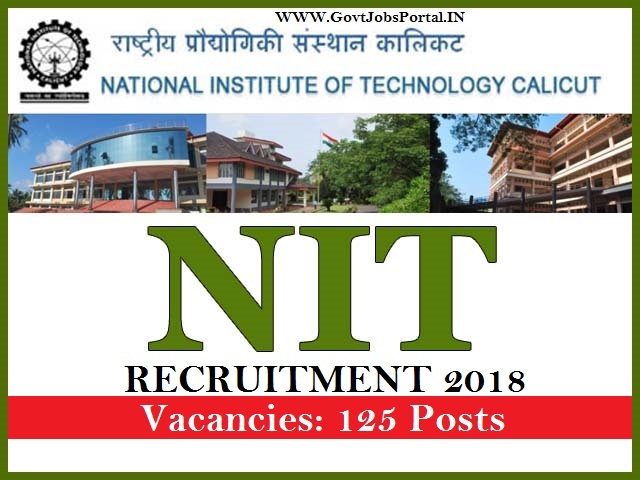 NIT Institute wishing to made a panel of qualified and well skilled persons for the engagement of temporary basis posts in various Departments/Schools for assisting in the Laboratories, Computer Centre and Workshop etc. The recruitment for all these posts will be purely on contract basis and will carry a consolidated monthly pay of Rupees Twelve Thousand Five Hundred only for Diploma holders and Rupees Ten Thousand Only for ITI holders per month. Interested candidates with specified qualifications explained below can report to the office of concerned Department/School for diagnostic test (if required) on the date of interview with all certificates in original and a set of photocopies. Direct Walk- in-interview will be conducted by NIT (National Institute of Technology) Calicut as per the schedule dates given below in this article. Only Degree/Diploma/ITI holders from Government/Government recognized Institutions be accepted. OBC candidates must furnish the OBC certificate (including non-creamy layer status) issued by a competent authority. The candidate should not have exceeded 27 years as on 01.07.2018. Age Bond: Should be less than 27 years for applying these Government jobs. Education: Those who have the following qualification can appears for the direct interview: “B.Tech / M.Sc / B.Sc / Diploma / ITI” in relevant discipline. More detail qualification detail read the official PDF file which we share below under IMPORTANT LINK Section. Pay Band: Monthly pay of Rs. 12,500 for Diploma holders. Monthly Pay of Rs.10,000 for ITI holders. Candidates have to apply these Government jobs through Off-Line process. There is no online application for applying these jobs. We share the direct link for application form. Just download the application form and fill out it with your detail. Come to interview with filled application form and your educational document. Date for Walk-in-Interview: 02nd July 2018 to 05th July 2018 from 8:00 A.M.